Solar Deep Well Pump System. This Listing is for model: SWPS1-180-NS (see table below). Provides well water for Cabin, Farm, Ranch, Livestock, Fish Pond. Solar Powered Well Pump Systems collects and converts energy from the sun. The energy generated supplies off-grid electric power to operate and control well pumps for irrigation or to provide a livestock water source in remote locations. High performance design that provide excellent low light performance. Panels feature a heavy duty extruded aluminum frame with high transparency, low-iron tempered glass. Your system will include one, two or three solar panels depending on the model you order. Solar Panel Mounting Bracket Rugged pole mounting system constructed from heavy-duty corrosion-resistant 5052-H32 aluminum. 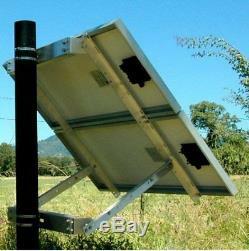 This sturdy bracket mounts to the side of a metal pole and has a wind capacity of up to 90MPH. This bracket mounts to a standard 2or 3 metal conduit pole available from all major home improvement stores, electrical supply houses and hardware stores. Voltage Regulator/Stabilizer/Booster Rated at a 10A capacity the voltage regulator/stabilizer will maintain a constant 24V DC output when the solar panel output voltage increases or decreases during varying sunlight. 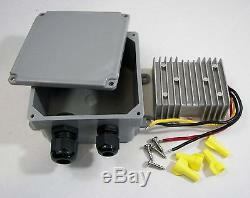 A weatherproof junction box is also included to keep the wiring connection between the solar power and pump protected. The solution to your remote water pumping needs. This pump is rugged, durable and built to last. 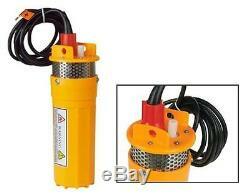 This pump delivers an average 96 GPH (360 LPH) at its maximum total lift of 230 feet (70M) when supplied with 24V DC. Its unique water-tight power connector stops water wicking and prevents potential condensation problems. The perfect design for livestock watering, irrigation or pond aeration. This pump can run dry without damage. The pump included with this listing has a diameter of 4.1. Your well casing must be larger than 4.1 to accommodate this pump. If you have a standard 4 SCH40 well casing you must order one of our systems that states that a 3.75 diameter pump is included. NOTE: EVEN THOUGH THIS MODEL PUMP CAN ACHIEVE A MAXIMUM LIFT OF 230 FEET, THE AMOUNT OF LIFT YOU CAN REACH IN YOUR OWN SETUP DEPENDS ON THE DEPTH OF YOUR WELL AND THE AMOUNT OF SOLAR WATTS SUPPLING THE PUMPS POWER AT YOUR DEPTH. THE DEEPER YOURE WELL, THE MORE SOLAR WATTS YOU NEED. THE MODEL NUMBERS LISTED IN THE TABLE BELOW SHOWS THE MANIMUM LIFT POSSIBLE BASED ON WELL DEPTH AND SOLAR WATTS. This System Includes DC Powered Well Pump (4.1 Diameter). 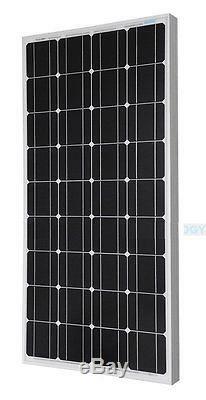 2 Solar Panels (see model number table). Solar Power Cable Set with MC4 Connectors. Max Submersion Depth Under Water. Integral Power Cord (attached to pump). Pump Dimensions (Diameter x Height). This Listing is for model: SWPS1-180-NS. Models with Standard 4.1 Diameter Pump (For well casings 4.5 or larger). Models with 3.75 Diameter Pump (For standard 4 SCH40 Well casings). Based on full direct overhead sun. NOTE: THE SYSTEMS LISTED ON THIS PAGE DO NOT INCLUDE BATTERY BACKUP. IF YOU WANT TO PUMP WATER ON DARK, NO SUN DAYS YOU NEED ONE OF OUR SYSTEMS THAT INCLUDE BATTERY BACKUP. Average Flow Rate Based On Solar Watts & Vertical Lift. Average Flow Rate Per Hour. Minimum Solar Array Size Needed. How much water will I get each day with this system? The average amount of water this system will provide depends on your total vertical lift and the system model number youre ordering. First, find your Average Flow Rate Per Hour for your Total Vertical Lift on the chart above. Then, find your Pump Average Run Time from the model number chart above for the model number your ordering. Average Flow Rate Per Hour x Pump Average Run Time = Average Daily Water Supplied By Pump. An example for a 160ft vertical lift and 5 ½ Hr Pump Run Time would be. 98 Gal x 5.5 Hrs = 539 Gallons/day. NOTE: YOUR WELL MUST HAVE AN AVERAGE WATER PRODUCTION RATE OF 1.6 GPM or MORE TO PRODUCE THE AMOUNT OF WATER STATED IN THIS LISTING. 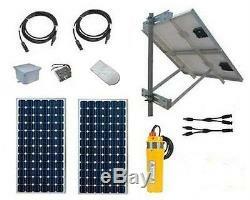 What is not included that you need to install this solar well system? Here is a list of items needed to install this system that are not included with this listing. / U-Bolts 10-12ft recommended with 4-5ft below ground with a concrete base. You will need two U-Bolt clamps. The size depends on your pole diameter. / Splice Kit Running from the pump, up the well and out to the wiring junction block. The pump comes from the manufacture with only 9ft of cable attached. There are two ways to add a longer cable. You can remove the 9ft cable attached to the pump connector and install the longer cable directly to the pump without needing to splice the wires. If you want to do this type of cable upgrade you need to use a similar waterproof 2 conductor 10AWG cable. Or, you can leave the 9ft cable attached to the pump and splice on an additional length of cable. The splice junction must be insulated well after you join the wires together. All the major home improvement stores sell pump cable by the foot. Water Hose / Hose Clamp. The pump has a ½ barbed fitting. You need ½ hose to connected to the pump and run up and out of the well. The best hose to use for this is the black Polly flexible type. This type hose is available from all major home improvement stores. You also need a hose clamp to secure the pump to the hose. (To secure the pump when lowering or raising the pump from the well you need to attach a safety cord to provide protection of losing your pump down the well should your wires break and or hose brake). Can I add battery backup later? Yes, you can add batteries and a solar charge controller later so you can still pump water on dark, no sun days. If you decide you want to have a complete battery back-up system from the start see our other listings. Give us a call if you have questions. DO YOU NEED HELP UNDERSTANDING THIS SYSTEM, OR HAVE MORE QUESTIONS. JUST GIVE US A CALL AND WE HAVE HELP YOU DETERMINE THE CORRECT SYSTEM YOU NEED AND ANSWER ANY QUESTIONS YOU MAY HAVE. CONTACT OUR MAIN BUSINESS OFFICE IMAGINE INSTRUMENTS LLC. The item "Submersible Water Pump Kit Solar Well Pump PV Powered Water Pumping Kit" is in sale since Wednesday, June 22, 2016. This item is in the category "Home & Garden\Home Improvement\Electrical & Solar\Alternative & Solar Energy\Solar Water Pumps". The seller is "e-supplymart" and is located in Liberty Hill, Texas.